I have always loved ambient metal, its earthy tones and raw power is not something that should be ignored, especially when mixed in with touches of acoustic shoegaze magic. National Sunday Law deliver a perfectly polished sound that represents the greatness of a band who seem custom made for the modern elitist metal scene. (Elitist in a good way) There songs are long and epic with lots of beautiful colors being incorporated into their vivid soundscapes. With influences like Godspeed You! Black Emperor, Isis and King Crimson you get a feeling for the kind of upper crust intellectual metal that this band is going for. A group who is sure to be loved by the geniuses behind Invisible Oranges I can see National Sunday Law going far as a band who create lush sounds that any metaller, or even shoegazer can fall in love with. 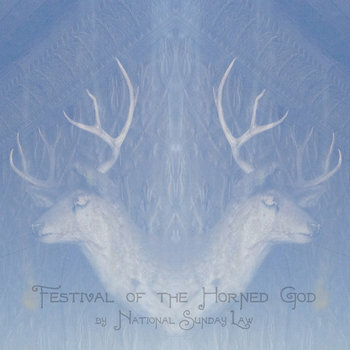 Their latest record Festival of the Horned God is a testament to their incredible potential (they have two other releases available for free on Bandcamp as well). A potent act that very much fits the bill of what 2013s 'Hipster Metal' scene is creating I am looking forward to hearing more from National Sunday Law.